The speed, efficiency and above all the freshness are essential in the food distribution. 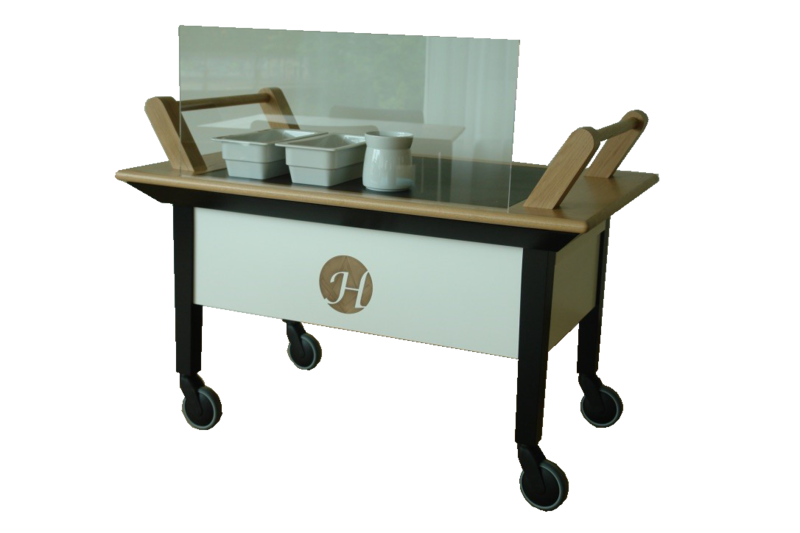 For this Gastros has developed the first battery-powered food distribution cart which guarantees the best food quality at simple distribution of the dishes. Meals can therefore be taken from room to room of the residents, patients or customers or can be placed for food distribution at the community room (mobile buffet). Either way, thanks to the integrated lithium-ion battery the food can be consistently kept warm up to one hour, from the kitchen to the target point on an area of three times GN 1/1. The front mounted control panel allows simple, intuitive temperature control of each warming field at four temperature levels. By means of the easy-care the stone surface achieves a simple presentation of any induction-safe dishes. The size and material of the cart can be customized.